Mix the dry ingredients in a small bowl, so all the spices and the breadcrumbs are combined well. Then in a big mixing bowl combine the turkey, egg, sambal and the dry ingredients so they are nicely combined. Form bite size balls with your hands and set them on a plate or cutting board. In a big frying pan heat up a generous dab of butter and some vegetable oil. Once the butter is melted and nicely combined with the oil, start setting your meatballs in the pan and fry until nicely browned (make sure they are cooked through). Do not overfill the frying pan, because that will bring down the temperature in the pan and your meatballs won't cook evenly. SO you might have to cook them in two batches. Once they are cooked set them aside in a ovenproof dish and keep warm in the pre-heated oven. Once you've fried all your meatballs, you can start on making the gravy. Deglaze the frying pan with a cup of red wine and half water, stir until all the brown bits are dissolved, bring to a simmer, then add the mushrooms and let them cook until they are soft. Salt and pepper to taste and maybe add some more of the sambal if you want the gravy spicy. Once the mushrooms are cooked, mix the cornstarch in a cup with a bit of water, then add to the simmering sauce, this will thicken the gravy and you will not get any lumps. 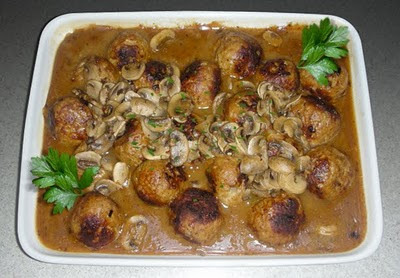 Take the meatballs out of the oven and cover with the gravy, serve with pasta or rice and a nice side salad.